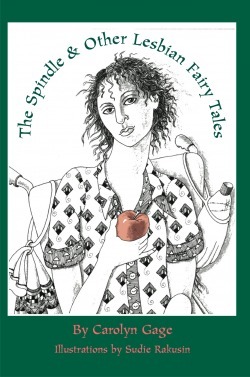 “Carolyn Gage has created a lasting feminist work in The Spindle and Other Lesbian Fairy Tales, one that shatters stereotypes, defies hetero-convention and will defy the years as it becomes a classic in every feminist’s library.”--Sacramento Arts and Entertainment Examiner. "Carolyn Gage offers readers important insight and representations in the powerful stories and imagery provided in The Spindle and Other Lesbian Fairy Tales. The collection meets the challenge of creating lesbian fairy tales that look unflinchingly at the world but are still imaginative, creative, and magical. Readers will enjoy these stories in all their complexity and bravery." Rain and Thunder, Northampton, MA. "You will discover that some of Carolyn’s stories, once read, fill an emptiness you hadn’t noticed was draining you of energy and hope. You haven't even known how to shape the hope into something you can name, something solid enough to pursue. And then you read the story—and it's all there—the hope, the name, the shape, the something to fill you up and lead you back into the struggle. And you think, “La lutte continue.” What she accomplishes with “The Furies” is what all readers and writers crave from fantasy, science fiction, utopian fiction—call it what you will… We crave a vision and Carolyn Gage has gone there, into that vision, and come back to show us how to get there. Brava! "—Susan Koppelman, editor of Women in the Trees: U.S. Women's Short Stories About Battering and Resistance, 1839-2000 and author of The Strange History of Suzanne LaFleche. A European princess meets an African woman prince in this romantic, multicultural, feminist fairy tale! A woman struggling with disability sets out on a ten-goddess quest for answers. Three lesbian surper-heroines debate the wisdom of accepting a young survivor into their league. Two lesbian surper-heroines discover that some of the most dangerous missions are the ones closest to home. In this “children's theatre for adults,” a young lesbian sets out to rescue the princess from the curse of the spindle-pricking on her sixteenth birthday, only to discover that the entire kingdom is under the spindle spell!